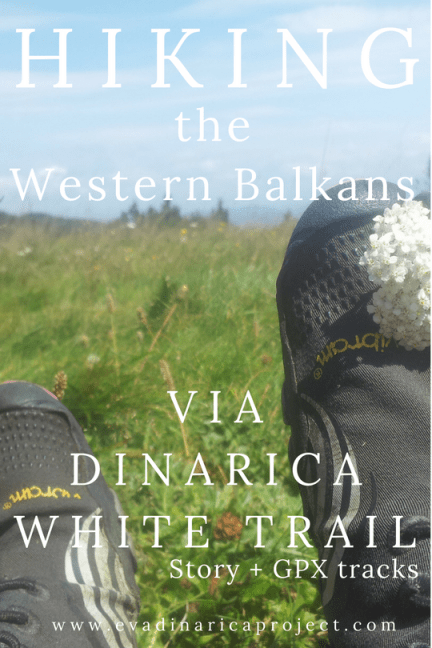 Last summer I walked a new long distance trail through the Balkans, the Via Dinarica White Trail. 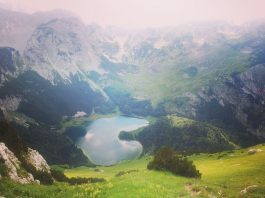 A route that finds its way along countless different mountain ranges, ridges, cliffs, canyons, valleys, rivers, lakes and prominent peaks in the Dinaric Alps, Europe’s largest karst field. 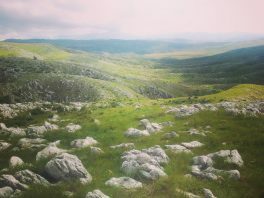 Hiking Via Dinarica. A great hike, a beautiful journey and an unforgettable adventure. After one month preparing and acclimatizing in the Balkans, I started my hike in the lovely Valbona River Valley. Officially Albania is the last section of the route, but I wanted to start with the icing on the cake, Maja Jezercës, the highest peak of the Dinaric mountains. 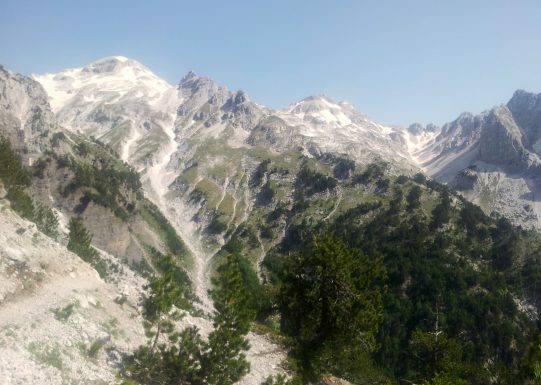 Surrounded by those whimsical, rugged peaks of Prokletije I felt small and clumsy, the so called ˝accursed mountains˝ absolutely intimidated me. Albania is rough… and sweet at the same time. When I gave up following the GPS track that tried to let me cross the border through severe Albanian wilderness, I met Drande, an sweet old shepherd lady. She took my hand, brought me to her house and showed me another way out of Albania. No words. Just a smile, a song and a hug. This encounter overwhelmed me just as much as the nature did. In Montenegro the mountains were green. Green valleys, green peaks, green forests, green fields.. Green, green, green in all possible shades and shapes. The trail leads you from National Park to National Park, it connects one stunning piece of nature after another. Day after day I slept high up in the mountains. Just a few little towns along the way, but other than that, it’s mountains mountains mountains. And sheep. 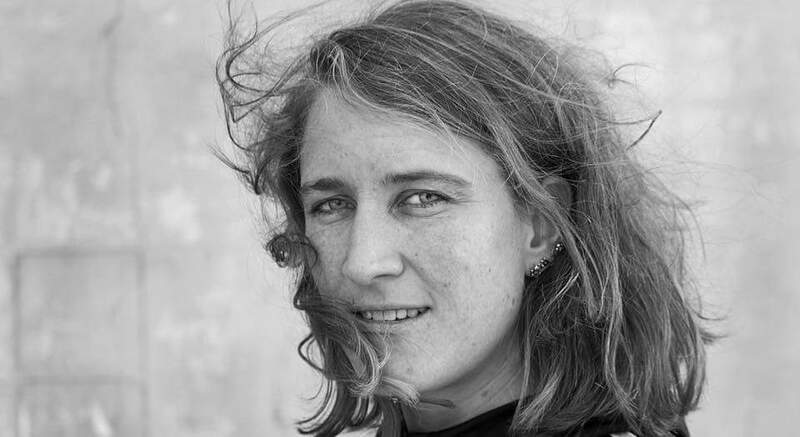 The only people I met, where either shepherds or rural farmer families who, during the summer months, live in small wooden cottages in the mountains, the typical Montenegrin katuns. Like a family I met in Sinjajevina. While the father and mother were busy milking the cows and making cheese, their two little boys showed me how to make fire. And how to prepare and drink coffee. Apparently I did it all wrong, I even got the feeling that they were making fun of me.. Although nature does not know borders, borders are often formed by nature. Drawn by people, but the mountains and rivers are natural borders. Within these borders, the countries seem to develop their own characteristic identity. Shaped by nature, culture, climate. It did surprise me that hiking through Bosnia and Herzegovina felt so different from Montenegro. Different landscape, different mountain-rhythm, different weather and yes, different lives and lifestyles. I even got the impression that the way people express themselves differs from country to country. But there are also things that stay the same. The hospitality for example. Coffee, rakija, food and the unshakable belief that it’s better to travel together or even in a group. From Albania to Slovenia people asked me the same questions: ˝But why alone? No good!˝ ˝Where is your husband?˝ ˝What does your mother think of this?˝ ˝Aren’t you scared?˝ They were curious and impressed, but most of all, people want to spend time together. All of them welcomed, invited or accompanied me in their own warm and friendly way. I literary walked into their lives and they opened their doors, their arms and yes, sometimes even their hearts to me. So I did the same. That is in my opinion the most precious thing you have to offer. Trust and time. 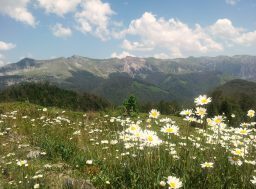 The Via Dinarica is a trail that is still in progress, only in Bosnia and Herzegovina the White Trail is officially open. In the other four countries the route is a combination of old existing trails that all together form a corridor through the Dinarides. With a distance of almost 600 kilometers is the Croatian section the largest of the Via Dinarica, but not all stages are finished yet. That’s why Croatia needs a slightly different approach, for now. 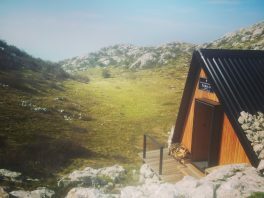 Hiking trails between the popular places (pearls) like Dinara, Paklenica, Northern Velebit and Risnjak are often overgrown or don’t exist at all. 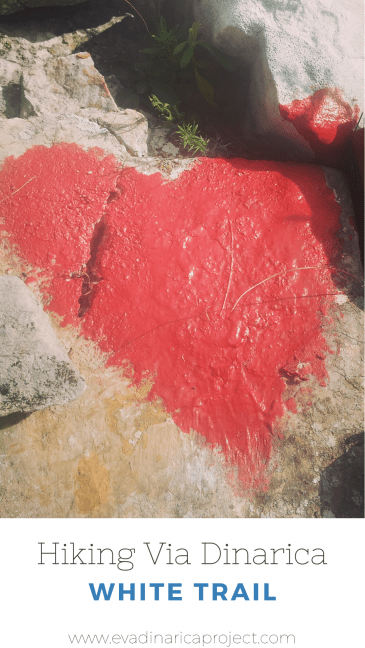 One option is to skip these ˝in between˝ parts, but I choose to connect those pearls by hiking the biking trails. A lot of asphalt roads, but on the other hand a lot of time to look around. Since these roads are often parallel to the coastline, they offer you a great view on the sea. 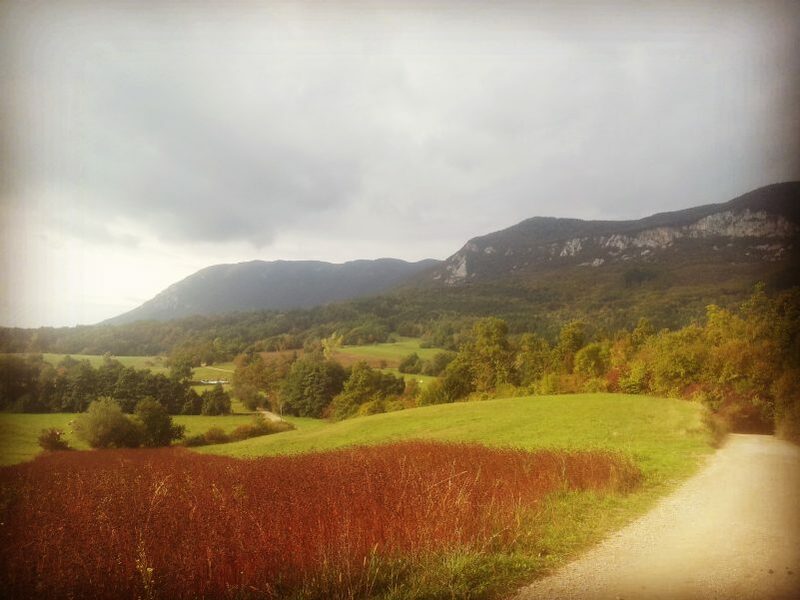 By the time that I arrived in Slovenia, it was autumn, full on. Less hours of sunlight, freezing cold nights (and mornings) and mountain huts that were already closed. The hiking season seemed to be over. 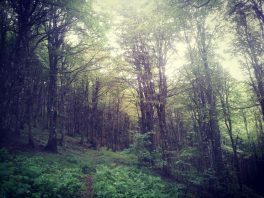 At the same time the beautiful forests of Snežnik and Sviščakih turned into a magical romantic scenery. Slovenia’s green karst region might even be at its best in October when the trees, the leafs, the fields and the hills all adopt the beautiful warm autumn colors. 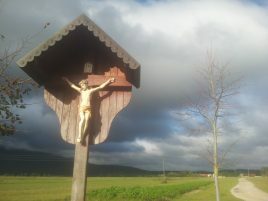 It absolutely gave another dimension to Slovenia’s typical sweet fairy tail landscapes. Nanos was my finish. An enormous plateau at the beginning of the Dinaric Alps. 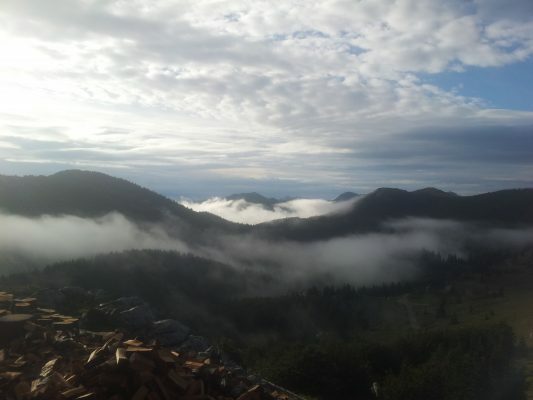 I hiked from the pointy sharp peaks of Prokletije to the friendly flat Nanos plateau. 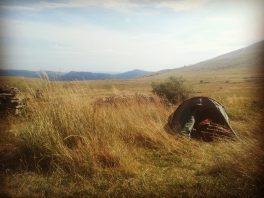 Four months in the mountains, 1500 kilometer through the Balkans. And honestly I would walk all the way back if I could. 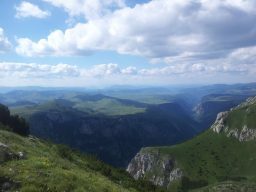 This is a selection, for the complete list of articles (about the Via Dinarica Hiking Trail) check out my “Publication” page. And since I’m already sending you away… If you want find out more about practical Via Dinarica stuff, have a look on my “Via Dinarica Practical Information” page. And yes, I do accept your support!